Compass Airlines is pleased to announce it has reached an agreement with its pilot group to extend the pilots' Collective Bargaining Agreement (CBA) through 2022. The extension contains a number of pay and quality of life improvements, while simultaneously allowing for new initiatives that will improve Compass's ability to recruit pilots. Complementing Compass's competitive First Officer compensation are increases for Captains that will allow Compass to remain among the leaders in Captain pay among comparable regional carriers. Additionally, the extension includes an agreement to allow new hire First Officers with previous 121 experience to carry over longevity from their previous carrier, as well as the ability to offer new hire pilots a signing bonus. These improvements will allow greater responsiveness to market conditions in a competitive market for attracting pilots. "We were very pleased with the collaborative nature of this process," said Rick Leach, Chief Executive Officer of Compass Airlines. "This extension ensures that Compass remains among the leaders in regional airline pilot pay, which is critically important, given the recruiting challenges facing the industry today." "We appreciate the partnership of our pilot group, who understands the importance of cooperative solutions to hire and retain pilots at a time when pilot recruiting is more challenging than it's ever been," added Bob Gleason, Chief Operating Officer of Compass Airlines. "With the new increased pay rates, we continue to move forward within the regional industry," said Capt. Nikolas Wagenknecht, Master Executive Council Chairman of the Compass Airlines Air Line Pilots Association. "We look forward to building a positive relationship with the Company." Compass Airlines serves over 6.5 million passengers a year, with approximately 280 daily flights providing service to more than 40 cities in North America. 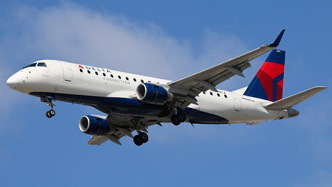 Compass operates a fleet of Embraer 175 aircraft on behalf of American Airlines (as American Eagle) and Delta Air Lines (as Delta Connection). Headquartered in Minneapolis, Compass has crew bases in Los Angeles, Phoenix and Seattle.